Pumpkin pie disaster | Help! I live with my Italian mother in law! I’ve been at it since 9 a.m., first I had to clean the “zucca” of seeds, wrap it in tinfoil and bake it until it was soft enough to cut the hard flesh. It’s now 11:20 a.m. I’m covered in shreds of pumpkin (don’t ask), and this sloshy pie is swimming in the oven with no sign of firming it’s plans up to be a pie! All I can think is that my to do list today was quite simple, bake pie and study. Oh, did I happen to also mention that in all this excitement the dog bit Mama too? The crust on the pie will be black for sure by now but the middle stuff is still sloshing after 45 minutes in the oven…should I throw in my Betty Crocker apron now or what? I’m actually not that inept in the kitchen it’s just that this is my first pumpkin pie without using the canned crap you buy in the supermarket that has the perfect recipe on the label. I truly thought this was going to be an easy affair and instead my tummy is rumbling for lunch already and there is pumpkin bits everywhere! I can’t go into my bathroom to wash up because that just so happens to be where the biting dog is repenting for his sins…so forgive me but next time I’ll bring the wine, okay? Oh, and Happy Canadian Thanksgiving eh! Da pie...would you want to eat this??? 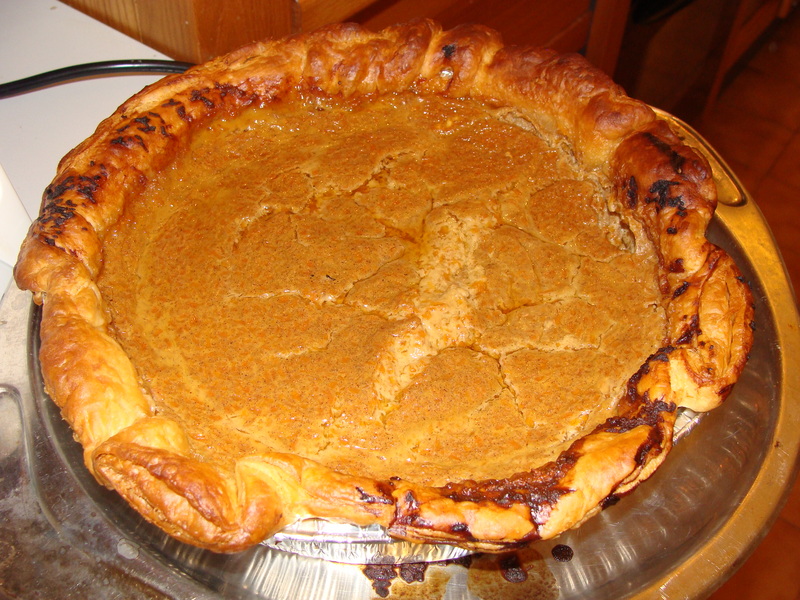 This entry was posted in Food, Mama and tagged baking, pumpkin pie, thanksgiving. Bookmark the permalink. I am sitting here laughing because it is just after five in the morning here and I would have just gone and found agood akery to get them to make the pie or bought the canned crap in the grocery store because i am not a cook and make no beans about it. I hate having to cook, but love eating and hope your day gets better, and maybe the dog will repent frm his sins. Have a good glass of wine or two and things will be all better. About the only thing I can cook well besides spaghetti are grits and eggs and that is what I am cooking this morning and they are just about ready. I can usually manage to get it right. I think it is booooootiful!!!! Not yet…will let ya know. Too bad you can’t get the canned pumpkin here, or at least, not in Bologna you can’t. The best way to avoid it being all watery is to freeze and thaw the pumpkin mash so that the water will separate. At least, it works for me! Can anyone tell me WHY Halloween pumpkins here stink so bad, are so expensive and are absolutely inedible??? I hope your Thanksgiving went well, mine (US expat) is coming up soon.